On-demand delivery service app MagicTiger has acquired Instano, a chat-based ecommerce application that offers on-demand delivery of services, for an undisclosed amount, a statement said. As part of the deal, the core Instano team will join MagicTiger. "Instano has been one of our best competitors with a focus on operations as well as quality," said Pratyush Prasanna, co-founder of MagicTiger. "We have a great synergy in Instano team's vision and strategy," said Arun Kumar, another co-founder of MagicTiger. Instano houses a network of merchants and retailers on its platform across a number of categories including food, cosmetics, pharmacy, fruits, groceries, electricity and plumbing services and delivers products to users from them. The startup was founded by Rajesh Ranjan, Rakesh Andey and Vedant Agarwala in 2014. Both Ranjan and Andey are graduates of Indian Institute of Technology Kharagpur while Agarwala graduated from National Institute of Technology Durgapur. It has been funded by Eventifier co-founders—Jazeel, Saud and Nazim. The Bangalore-based startup claims to be offering 30-minute delivery. The acquisition comes a little over a month since MagicTiger bought Zoyo, an artificial intelligence-powered shopping platform. Earlier in July, MagicTiger had acquired rival startup Godeliver for an undisclosed amount. MagicTiger allows users to order groceries, food, movie tickets, travel tickets and any other service. 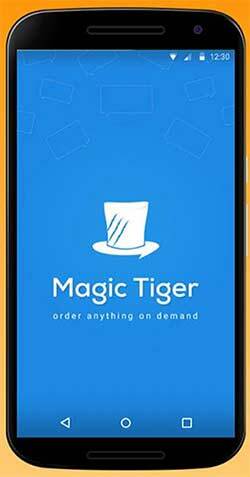 MagicTiger was founded by Pratyush Prasanna (former executive of Paytm and Plustxt) and Arun Kumar (former employee of Tutorvista and Portea). It is promoted by serial entrepreneur and investor K Ganesh and Srinivas Anumolu through the venture nurturing platform Growthstory. Chat-based concierge platforms have been attracting considerable investor attention this year. Lookup, GoodBox and Goodservice had raised funds early this year. While Lookup raised $2.5 million in Series A funding led by venture capitalist Vinod Khosla's personal fund, Khosla Impact with participation from Biz Stone (Twitter co-founder); Goodbox raised $2.5 million (Rs 16.5 crore) in Series A funding from Nexus Venture Partners. Goodservice secured $1.6 million (Rs 10 crore) in seed funding from Sequoia Capital in June. Helpchat, which recently pivoted into a chat-based personal assistant app, had acquired Mumbai-based deals and discovery platform Niffler for an undisclosed amount.